Think of the coldest pain you’ve ever felt. The most painful cold, biting into your delicate earlobes, torturing your dead toes, eating into your fingers; no feeling, no hope, no vestige of pumping blood. Now multiply it by Leonardo DiCaprio in a bear rug. 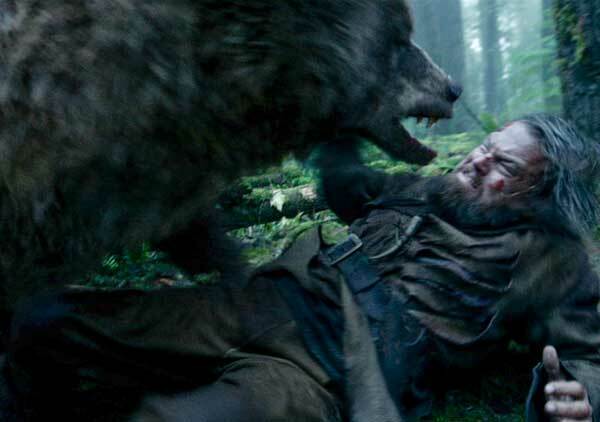 In the stark survivalist thriller THE REVENANT, Leo is tracker Hugh Glass, a real life frontiersman in 1800’s North Dakota, whose claim to notoriety was surviving a grizzly bear attack, being left for dead by his employers, and dragging his broken body across unforgiving wilderness to enact revenge on the man who deserted him and killed his son. Glass aids fur trappers, led by Captain Henry (Domhnall Gleeson), in unchartered North American wilds. The party is attacked by “Ree” Natives (short for Arikaree), in a realistic pitched battle, that seems so unscripted, it seems amazing no one got a flaming arrow through the throat. This earthy realism would inform every frame of this brute film. The reason all this movie’s action scenes are so overwhelming is because they are shot in 360-degree, unbroken takes! We can see and feel the mortal terror around us in real time. (None of that eye-straining BOURNE SUPREMACY/ TAKEN crash-cutting and camera-shake!) As he did with his magnificent BIRDMAN (2014), director Alejandro G. Iñárritu astounds us with unbroken takes that are simply incredible for their planning, blocking and pacing like buttah. There is also Bridger (Will Poulter, who was an insufferable nerd in NARNIA, then the masculine alpha male in MAZE RUNNER, and here reduced to a boyish waif amongst the giants DiCaprio and Hardy). Arrogant, blustery Fitz (who had survived a scalping by Ree warriors in the past) had a point: in this unforgiving wasteland, the primo rule was self-preservation. His money and life were at stake and Glass was potentially ruinous to both. In order to catch up to the fur party and claim his share, Fitz tries to kill Glass quickly and ends up killing Hawk instead, while Narnia whimpers in the middle background. Fitz and Narnia flee to the trader’s outpost, leaving Glass for dead. Tarantino may boast about his “glorious 70mm” (filmstock best utilized on sweeping vistas, for which there were only a few scenes in his HATEFUL EIGHT), but director Iñárritu actually delivers such grandiose beauty without all the boasting, via his cinematographer Emmanuel Lubezki. The proof is in this breathtaking visual poem; every scene, almost too much art for our natural senses to assimilate. Awe-inspiring, magnificent! The hardship of making this movie bleeds from the screen, as does the beauty and reward of that hardship. Based in part on the novel by Michael Punke, Hugh Glass’s obsessive revenge tale is nothing new in cinema, though the primal filmmaking techniques set this movie apart from other retribution tales. Strange then, that Glass’s final ruse is stolen from the last scene in CROCODILE DUNDEE II! Writers: Mark L. Smith, Alejandro G. Iñárritu, Michael Punke. Music: Ryuichi Sakamoto, Carsten Nicolai. Starring: Leonardo DiCaprio, Tom Hardy, Domhnall Gleeson, Will Poulter, Forrest Goodluck, Paul Anderson, Kristoffer Joner, Joshua Burge, Duane Howard, Melaw Nakehk’o, Arthur RedCloud, Lukas Haas, Grace Dove.